Christmas came early for Sugarland fans on July 27th, as the duo rocked out to a full house at the Ask Gary Amphitheater in Tampa, FL. This show was another great success on the interactive “In Your Hands” tour, which kicked off in Ohio back in April. The glowing Jennifer Nettles and her partner in crime, Kristian Bush were joined on the tour by fantastic up and comers Canaan Smith and Lauren Alaina. With a powerhouse act like Sugarland, one would think the new artists would feel pressure to deliver a crowd-pumping performance. Canaan and Lauren showed no signs of feeling pressure. Both entranced the crowd without fail, inspiring current fans and making a lot of new ones. Canaan Smith took the stage with upbeat material that will surely hit the radio soon. Smith even performed a special song with Kristian Bush and it seemed like the two were born to sing together… Watch out Jennifer! On my feet with everyone else in the crowd, the vibe was all love for Canaan as he finished off his set. Ready for Lauren Alaina to perform, no one was more excited than the 17-year-old herself. Sweet southern charm mixed with a totally badass voice, Alaina is pure talent. If everyone in Tampa that night got to vote for her on American Idol, there is no doubt she would have come out on top. Singing a song entitled “Eighteen Inches” written for her by fellow Idol contestant Carrie Underwood, one lyric stood out that described both Canaan Smith and Lauren Alaina perfectly; “Ready or not their new life’s gonna start.” I’d say these two are definitely ready, definitely incredible, and their careers have only just begun. “All I Wanna Do” is Watch Sugarland, Again and Again! Ready and eager for Sugarland to perform, the silhouettes of Jennifer Nettles banging on a drum and Kristian Bush strumming on his guitar appeared from behind the curtain and we all knew we were in for an amazing ride. Lights up, music loud, and an overpowering cheer from the crowd–Sugarland’s performance started off with more of an explosion than a bang. Even though the concert was in our hands, the duo had us eating out of the palms of theirs. They played favorites like “Stuck Like Glue,” “Something More,” and “It Happens.” In between songs, Nettles made a special effort to involve the crowd, making everyone feel welcome and apart of the show. She even brought a birthday girl up on stage to sing a song of her choice, and their duet would have made J-Rome (winner of ABD TV show “Duets”) a little jealous. Being an interactive tour, fans got to decide the set list, give live input throughout the show and Sugarland without a doubt delivered the performance we all wanted to see. Now, even though I didn’t get to hear my all time favorite song, “Little Miss,” the (*insert purely amazing verbs here*) stripped down, acoustic version of “Stay” made the whole audience reverently silent. It is performances like that one that signify the very reason we buy tickets to concerts. I think everyone would have agreed with me that we could have “stayed” there forever, just listening. Just as we think it’s all over…Sugarland pulls us right back in with a special guest performance, “Sing with Sugarland Winner,” Shelly Starks (Clearwater, FL). Sugarland + Shelly was a dynamic trio on stage singing “Baby Girl.” They reignited the crowd, right through to their last song “Sugarland.” At some point I lost track of just how many songs, all different styles, genres and covers, the band actually played throughout the night. It was incredible to see how personable the band was and how much they genuinely appreciate their fans. From everyone in the “Sugarpit” to those all the way back on the lawn, it was truly an amazing night for every single concert-goer. The “In Your Hands” concert tour is certainly all about the fans. I was fortunate enough to get the “inside scoop” on the show from a couple of young ladies who won tickets from a local radio station. Seated near me, they told me how excited they were for this show! 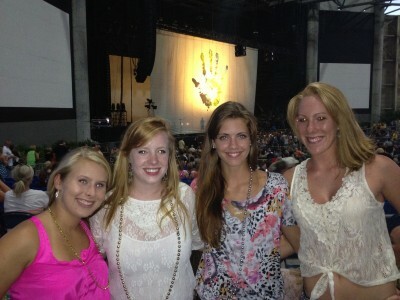 The four girls had never been to see Sugarland before but as “BIG” country music fans they were definitely excited. It was clear they were really impressed with the overall fan initiative. They said, “We definitely liked the whole new concept of getting to decide what you want to listen to. We really felt a connection with the band, and that was really awesome.” It was hard to pick out a favorite part of the show but they seemed to agree “Jennifer Nettles choosing so many fans to come on stage and taking the time to look at all the posters, really proved how much they love their fans.” The girls also shared their praise for Lauren Alaina and her “amazing voice, and ability to get the crowd excited!” For these lucky fans the concert was something they would “definitely” see again! Once again, Sugarland proved just how incredible they are! 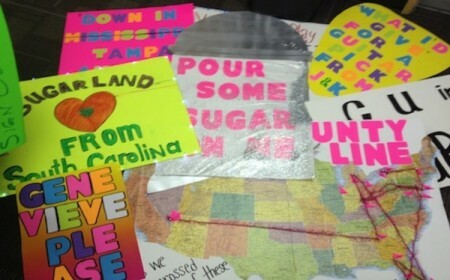 I am sending lots of love from all of us at the Tampa show. I would like to send a very special “Congratulations” out to Jennifer Nettles and her new bundle of joy… Please keep in mind if it’s a girl, Sarah is a great name choice. Annnnnnnnd another “Congrats” to the band on their future induction into the Georgia Music Hall of Fame! OK, and one more congrats for just being awesome! Thanks so much for an amazing show… now “all I wanna do” is see it again!